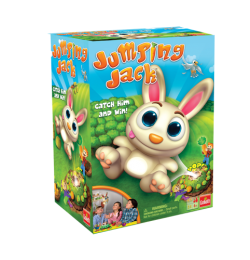 We received Jumping Jack from Goliath Games . 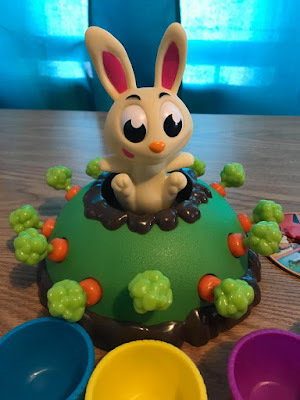 This is the cutest little bunny game for children ages 4 and up. It is a 2-4 player game that has been tested for quality and safety. 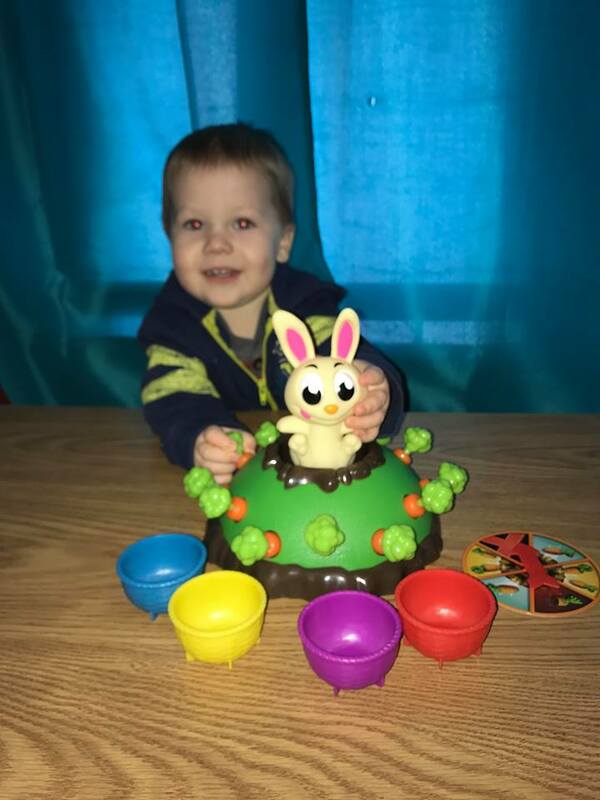 My first grade grandson loves this game. He has been trying to teach his little sister to play. The game is an easy play. This is a delightful preschool game of mounting excitement. 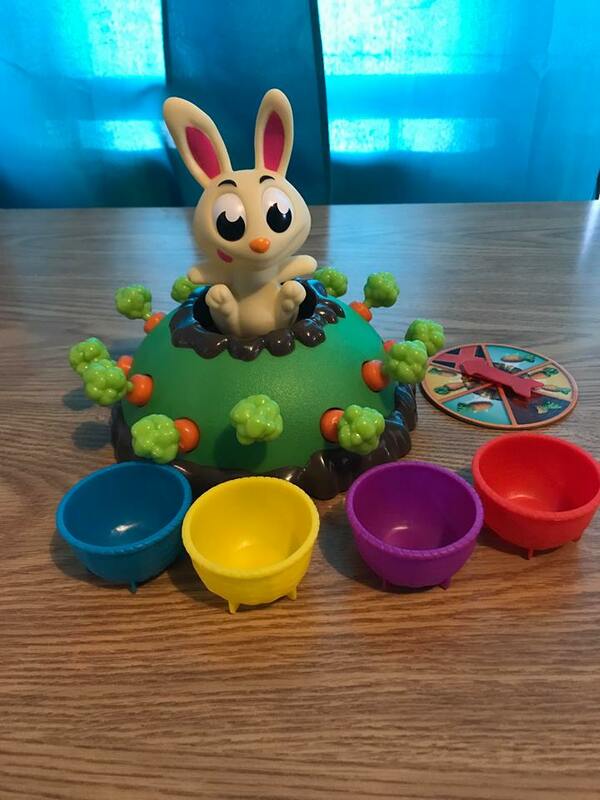 Players will spin the spinner to see how many carrots they will get to pick from Jack's bunny hill. One of the carrots will make Jack jump. It will be a different carrot with each turn. If Jack jumps on your turn, you can win if you catch him. There are extra rules that let every player try to catch him when he jumps. If none of the players catch Jack the player with the most carrots will win. This fun little preschool game teaches children hand-eye coordination, taking turns with each other and quick reactions. Goliath Games markets brands such as Rummikub, Triominos, Rolit, Wordsearch, Pop the Pig, Doggie Doo, Gooey Looey, Robofish, Domino Rally and many more sold under the flag of Goliath. Currently Goliath owns and operates offices in France, Germany, Spain, Portugal, Poland, Belgium, Netherlands, USA (Goliath LLC and Pressman), Canada, Hong Kong and Australia (Crown & Andrews). Their head office (R&D, financial administration and logistics) is located in the Netherlands, from where we export to approximately 70 countries world-wide. The Goliath slogan is ‘Clever Together!’ this applies to their products that combine fun and wittiness, as well as the internal processes of creating and marketing them. If your interested in learning more about Goliath Games or want to purchase your own Jumping Jack Game you can connect via Facebook , @GoliathGamesUS , You Tube and Goliath Games Website . Love it! I think my six year old wouldn't get bored so quickly with a game like this. He often gets bored with the rules of board games. I have not even head of Jumping Jack yet, looks like such a fun game to add to the household. I am going to have to see about getting this! This is a nice game/toy for the younger kids. I can just imagine the squeals and laughter! Will recommend this to friends who have young children. Thanks for the product review. What a super cute game! My girls would love it! What a great game for little ones. I like how it teaches counting skills, as well as hand eye coordination. I want to get it for my granddaughter. This is a fun looking game! Looks like such a cute little game for the little ones. Perfect for a 3 year old. I do believe he would love it and something the 6 and 10 years old would play with him.